My high street coat edit is complete -it's time to either re-discover last year's coat OR, if that's been hanging around for a bit too long in your wardorbe and has gone all bobbly/out of style time for a NEW COAT! I've been trawling the shops to find exciting stylish coats that are 'on-trend' but some would last a few years. For example, tweed is huge this season but when you think about it, it never actually goes out of fashion, it's a classic. Pink is massive but if it's your colour then you can get a few years out of a pink coat too. Vintage faux fur is HOT and again, I'd wear one of these for years, they've been 'in' since I was about 19. So to illustrate my blog I now do a facebook live video each week which you can view on my FB page here. Unfortunately now I've view it, it's a bit blurred - not great, must try harder. So here you can see clearly the coats I suggested. H&M are seriously good this season, I mean look at the leopard faux fur! It's pretty awesome and only £79.99. Also the tweedy long coat with the fur collar looks great on. As well as that, in-store, they have some great khaki parka's with faux fur collars too. Great choices at &Other Stories too. I like the colour palette in there this season - lots of warm colours and tactile cosy coat options. This red check alpaca mix is a cheery choice. 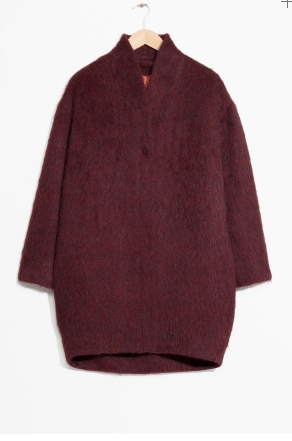 Burgandy from & Other Stories, very autumnal, good for work. Ringing the changes. Vintage look faux fur from &Other Stories. Now this is a statement and a half with a 70's vibe. Not up for full faux fur? Here's a good entry level option, fail-safe navy with a glamorous faux fur collar from &Other stories again- LOVE this! Now on to this more sober option. I have to say, it looks a bit dull in this photo but in real life, this Jigsaw blue tweed is a beautiful coat. Very classic tailoring and gorgeous blue tweed fabric. in an ideal world I'd have the faux fur leopard print for fun and this for when I want to look really pulled together. I've added a photo of me in it from my Instagram feed this week looking miserable but underneath, loving the coat! I also found this parka coat in M&S which is very similar to an Isabel Marant coat but for only £79.00. Comes in blue camo too. Finally, I've found a stylish practical coat with a hood too. Particularly good if you've kids in tow and can't manage an umbrella. Again, taken from my instagram feed this week - it's by Kin at John Lewis and would do for a few months but not when it's freezing. For those times, invest in a NorthFace, best money you'll spend on a weather proof coat. Lisa Gillbe is a personal stylist and shopper based in London. Get in touch today if you want help with your autumn wardrobe this year.